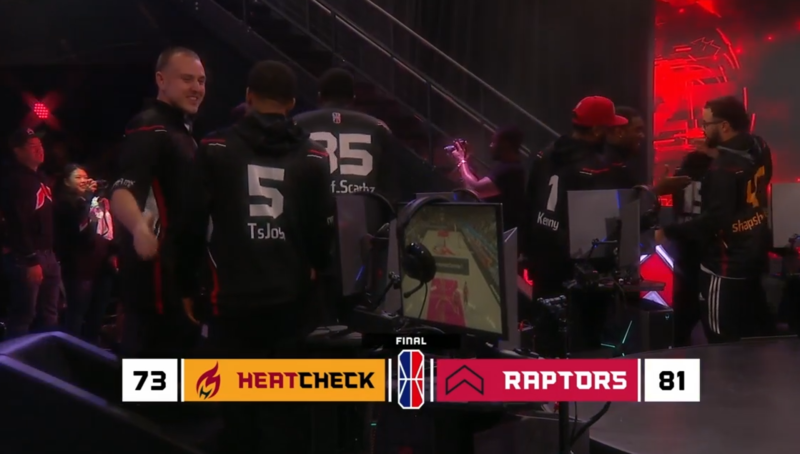 In a do-or-die game for the Uprising, they proved more than up to the task, defeating Heat Check Gaming to clinch a playoff berth, eventually the No. 4 seed, while this and the Heat’s second loss of the day dropped the South Beach squad to the sixth seed. No offense has integrated the shot-creating slasher better than the Raptors. Few shot-creating slashers are better than Heat Check’s Hotshot at scoring and distributing at will. While AllHailTrey had stopped his share of shot-slasher while on the sharp rim protector, the Raptors can be prone to pinching too often, and Hotshot is good enough to find the open man. Yusuf pinches and Hotshot finds Majes7ic for a corner three, but here, as in a previous setting, the Raptors get a break. They cut down on their help defense and Trey limited Hotshot to 35 points, well below his average at the powerful build. On the other end, Kenny played one of his best games of the season, scoring 34 points and dishing out nine assists. He played smart, scoring without great effort but more importantly making smart plays to force the Heat to respect the Raptors’ potent three-point shooting and thus stay home. Here’s why that pick-and-roll works so well, explained in a Film Room post. Quai grabs a Kenny miss over Hotshot, and then, even as Jalen and Majes7ic pinch, throws down a big slam dunk to increase the Raptors’ lead. The driving force, though, is still Kenny at small forward. The Heat switched around their lineup in order to defend him with Majes7ic, a tactic that worked well in the Heat’s regular-season victory over Boo Painter and Wizards District Gaming. In this game, Kenny was able to consistently get buckets when necessary while facilitating enough to keep the Heat defense from swarming him. The Raptors will probably need to get Josh more involved in ballhandling duties, especially the lethal pick-and-pop with AllHailTrey. They probably won’t face a similarly space-oriented offense in the first round of the playoffs, against Cavs Legion GC, and they certainly won’t face one if they make it to the second round. But as I said, no one has done a better job balancing their offense with the powerful shot-creating slasher than the Raptors. They have real reason to be confident. They know how to win do-or-die games. They certainly won this one.